In honor of Julia Child's 103rd birthday, we decided to keep things simple. 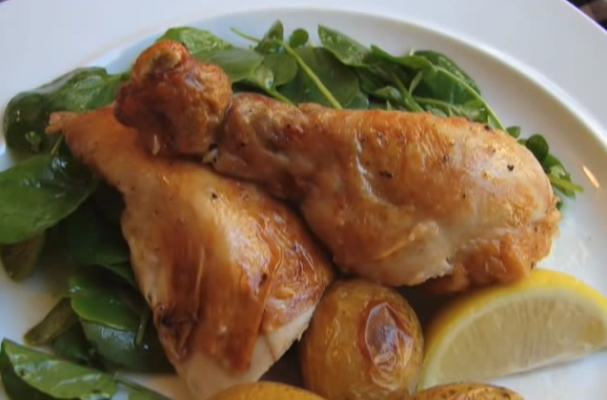 While cake is customary, we felt it more appropriate to share her famed roasted chicken recipe. This simple and homey meal is perfect for any night of the week and leftovers can be used in a variety of different ways from soups, salads, sandwiches and more. Julia Child is principally known for sharing the art of French cooking with the world, and especially with the United States. But more importantly, she was a meticulous cook and examined every process to make sure it was precise so that she, and others could replicate it in their own kitchens. Her passion for food was infectious and lives on through every recipe and re-run.